Of course, SEO back in 2003 was a very different beast. It was much easier to game Google. Content marketing as a term did not even exist back then. I bought BlogBrandz.com in 2004, started blogging using the Blogger software, and became pretty good at it. But it was 2015, and I had to admit to myself that I was not a good blogger. My 500 to 700 word posts were just not going to cut it anymore. I was done with that. From now on, I would make an attempt to write well-researched and detailed posts of at least 1500 words, if not more. I would try to write content that was the best in its category. I decided that, if I was at all serious about growing my business, I had to stop hiding in the shadows of mediocrity and start giving some love to my own blog. In this case study, I show how using Brian Dean’s Expanded List Post (ELP) Technique help me grow my blog traffic by over 700% in just a few months. On 17th July 2015, I published the huge list post below – or, as Brian Dean calls it, an Expanded List Post (ELP) – that ran over 4000 words. I spent a couple of days working on this post. However, at this time I was syndicating my blog to an aggregator site called Business2Community, which picked up the post the day after it was published on my site. 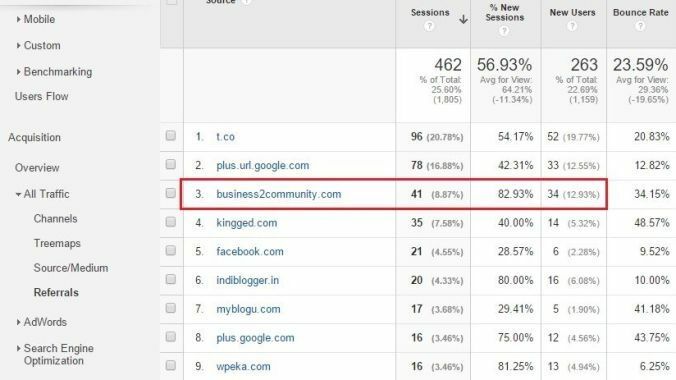 The result was that my post on Business2Community got a top 3 ranking for the keywords “increase social media engagement” while my own domain was nowhere to be seen. Google probably thought it was duplicate content and omitted the post on my domain from the search results pages. Ouch! Still, my article did have a top 3 ranking, and the ELP on my site did get about 10 times the number of shares that my other posts had got till now. That was some consolation. So, I continued working on my blog, aiming to write posts of over 1000 words minimum, but no more ELPs. Sometimes the posts worked, most times they didn’t. In July, my traffic stats looked like this. The expanded list post had given me a little bump in traffic, but not much more. Thanks, largely, to the fact that I was syndicating my RSS feed to another site with more domain authority than mine. To be fair, content syndication on Business2Community worked great for boosting my reach and branding, especially with a small blog like mine. It helped me get published on Yahoo Small Business (now called Aabaco Small Business) and Monster.com and also gets me some referral traffic from their site. But it’s lousy for SEO. Then in September 2015, I gave a talk at WordCamp Pune, wrote up an ELP of almost 3000 words based on my talk, created an infographic for it, and published it here. A couple of days later, the Moz+BuzzSumo Report on Analyzing 1 Million Articles came out. Inspired, I wrote up another ELP of just over 1600 words and published it. These two posts went on to rank among the most popular posts on the blog. But I was still syndicating my content to Business2Community, so the search engine traffic wasn’t exactly rolling in. In September 2015, my traffic stats looked like this. This jump constituted a seven-fold (700%) increase in the number of sessions since January 2015. Even though my posts did not go viral or get an insane amount of traffic, the comments, shares and traffic on my blog had increased many times over since I started using the Expanded List Post (ELP) Technique. 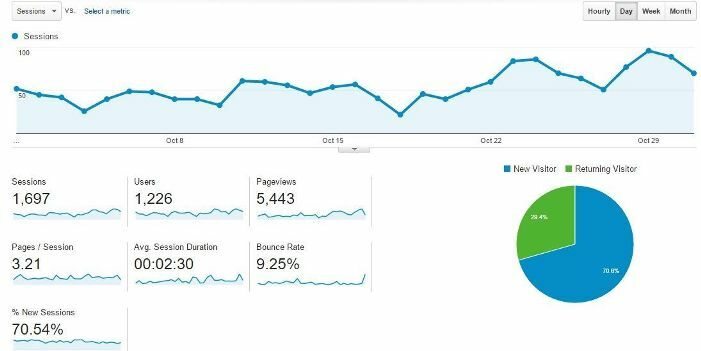 In October, my traffic dipped slightly because I did not blog much. But my pageviews had gone up from 675 in January, to 5,443 in October – an eight-fold (800%) increase. The number of Pages/Session had increased from 2.18 to 3.21, and the average session duration went from 00.37 to 2.30. You can see the increase in traffic from January 2015 till now. The significant spikes in traffic are a direct result of publishing the Expanded List Posts. Readers were also spending more time on the blog and reading more of the content. I finally decided to stop syndicating my content, and on 22nd October, I published an ELP of over 6000 words on my blog. As it was partly a collaborative effort, with contributions from a number of members at MyBlogU, the bloggers who had contributed to the post shared it on social media, and some of them linked to it from their own blogs. A number of readers also bookmarked it, because it’s an ‘always updated’ post. I’ve constantly updated it since, and shared about the updates on social media. Right now, it’s the most popular post on the blog and, thanks to a little Facebook boost, also has over 1.1k likes/shares. I must mention here, that I did not use any advanced link building strategies, such as broken link building to promote any of my Expanded List Posts. The only influencer outreach I did was to reach out to those bloggers whose articles I had linked to in my blog posts and give them a heads-up about it. Many of them shared the posts with their social media followers. I have no doubt that, had I spent more time on some advanced link building, the results would have been much better. But here are some of the lessons I learned using Brian Dean’s Expanded List Post Technique to boost my traffic. A number of studies have shown that long-form content (over 1500) words is what helps to get your content to stand out from the clutter today. I learned for myself that this is true and that it can work very well even for small blogs like mine. ELPs get a lot of shares and more links than your average post. A well-written and updated ELP can even get people bookmarking your posts. They also got a lot of comments from people who were happy with their usefulness. The effort you spend in writing your ELP pays off in spades. All those shares and links tell search engines that your content is valuable. On the 8th of November, my Blog Promotion Tips ELP ranked #3 on Bing for the keyword “blog promotion tips,” ahead of sites like Problogger. In Google, it ranked #21, which tells me that I still have a long way to go to build links and domain authority. Did you find this case study on Expanded List Posts (ELPs) useful? If you have some of your own insights to share, I’d love to hear them. Third I totally agree with you, if you can recall I shared with you a post on word of mouth marketing on one of your awesome posts “Journalism Ethics Guidelines To Make You An A-List Blogger” and to be honest I am doing pretty well with that one! Again just few days back I published another long evergreen post on Direct Marketing, I invite you to check it out, again I read a lot for it, researched too many things to come up with that, so you gonna definitely love it, I will be waiting for your response on that one! Lastly, totally agree that long over 2000 words, well researched, solid articles can do wonders, so I would definitely suggest to you and everyone to focus on that instead of writing those 500 to 800 words posts. Now am not saying that short articles like that won’t work because they do, like I have written an article on “Types of Customer Complaints” and to be honest its no more than 900 words and it is doing awesome in terms of organic traffic! But again that post is well researched, I have put citations from around 4 scientific articles in that little post. What I am trying to say, yes even short article can work, but it comes down to quality, definitely google bots aren’t like humans so their alogarithm considers long post to be something synonymous with quality content which is obvious but I guess google does have some other signal like bounce rate of specific article perhaps that signals google that this article is worth top SERPS. Again all of these are just assumptions, subjective opinion but I can assure you guys if you need organic traffic you have to 1. write evergreen articles (facts, evergreen research, evergreen howto’s) 2. quality article (authoritative citations, facts, at least 2000 words long ) 3. unique articles (provides a unique but useful take on usual things) and any article that has all these three things you can get to the in SERPS! I guess this is sufficient ;p, have a nice day Priya and yeah you are officially invited to check in that post on Direct Marketing! Glad to know your blog is doing so well, Arshad. Yes, short articles can work well when they’re well researched and offer great value to readers. But studies have shown that articles that are over 2000 words in length rank highest in Google. btw its Arshad ;p yes I made a typo there! so its not your fault! Have a great day, ttfn! Nice case study Priya, I am also a student of Brian Dean. More than just that the posts being long, I believe the long posts ranking high has something to do with viewer retention rate. Long posts naturally makes people stay on the post longer. Also I believe such posts attracts lots of social signals, which also has positive impact on Google rankings (eventhough Brian says they don’t). You’re right on almost all those counts, Spencer. Social signals don’t impact rankings directly, but they do affect it indirectly by allowing influencers and other bloggers to find your blog posts and possibly link to them. Thank you, Glen. Good luck with your efforts.